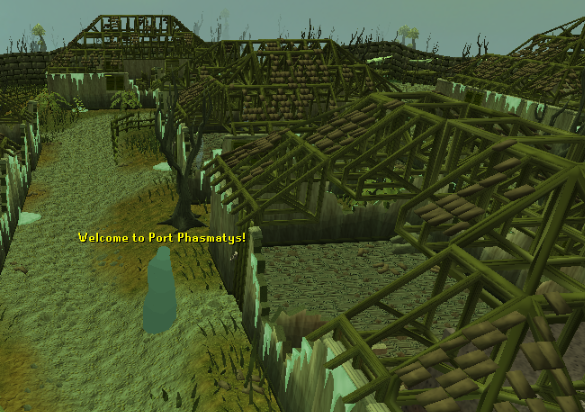 Port Phasmatys is a city accessible only by members and is located at the very northeast of Runescape's mainland. It is majorly inhabited by ghosts. The walls and scenery glow with a green ectoplasmic substance. Do not be fooled by its normal in-city features such as the third closest furnace to a bank, or it's cooking range, or the seemingly normal docks. This city is very, very out of the ordinary. If you are visiting for the first time and have not completed the Ghosts Ahoy quest, you will need to pay two Ecto-tokens each time you get into the city. 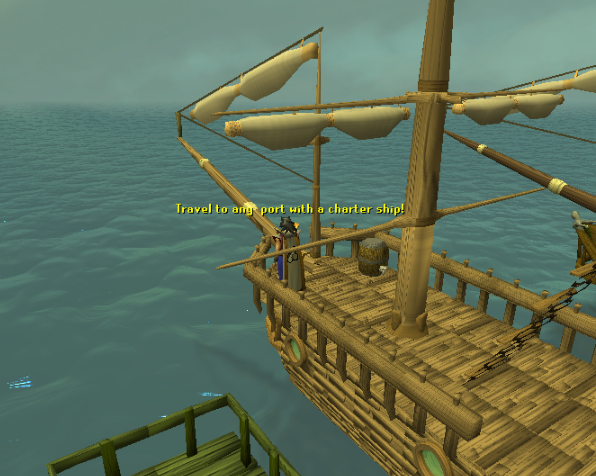 If you are buying a charter ship ride, you will not need to pay in Ecto-tokens. More on Ecto-tokens and how to get them will be explained later in the guide. But why are they ghosts? Well, Port Phasmatys was a largely prosperous port until Lord Drakan noticed them. He then sent his vampyre guards to collect blood from the citizens. Eventually when a man known as Necrovarus came from the unknown eastern lands, he discovered some ectoplasm below one of the buildings. He then discovered that it can be used to keep the vampyres at bay. Sadly, time passed and all of the citizens slowly became ghosts. You will need a Ghostspeak Amulet to communicate with the citizens but not to use the bank. Now get your flashlight, your anti-ghost charms, and most importantly your blanket and then prepare yourself for this wild guide! There are only a few ways to get here. If you have not completed the Ghosts Ahoy quest, you will have to pay a fee of 2 Ecto-tokens every time you enter the city through it's gates. You can enter the city without the need for Ecto-tokens by using a charter ship or by entering through the gate if you have completed Ghosts Ahoy quest. If you have unlocked the use of Fairy Rings, you may use Fairy Ring Code "ALQ" to teleport west of the city. This is however a very dangerous area filled with aggressive vampires and leeches. If you are not prepared to take some hits or heal with food, you should probably make sure you have full run on and make a dash. Port Phasmatys is located directly east. If you want to take the safe yet long way, use Fairy Ring Code "CKS" to be teleported west of Canifis. Walk east into the city, then just follow the path north and over through the Haunted Woods. It is a long walk but is definitely the safest. 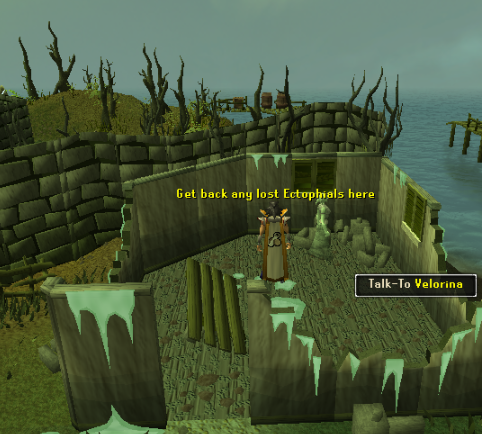 If you have done the Ghosts Ahoy quest, you will be rewarded with an Ectophial. This is a one-click teleport and upon use will teleport you in the building containing the Ectofuntus. It will automatically walk you through to refill if you do not lag. More information on that can be found later in the guide. Charter ships are also an option. This is a very good idea if you are visiting the city for the first time. You will not have to pay in Ecto-tokens. If you have your Bedsheet from Ghosts Ahoy quest in your inventory, you will not be able to take it on the ship going from the city. If you've played the Trouble Brewing Activity, you have the option of exchanging your pieces of eight for either a red or blue bottle of rum. When you drink this rum, you will be teleported to the Trouble Brewing Activity. They cost 2 pieces of eight. From there, head west and into the gates of the town to Bill Teach's ship to be taken to Port Phasmatys. There is no difference between the Red and Blue Rum except for the message you automatically say when you drink it. 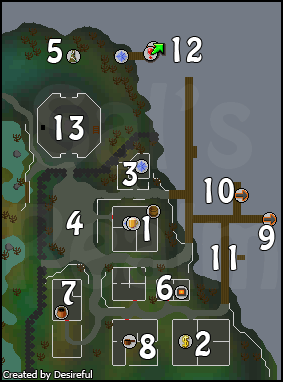 Like most teleports, this will not work beyond level 20 Wilderness. If you are a lower-leveled player or would just like to take the safe way, you can teleport to Canifis either by Fairy ring code: CKS or by the Kharyll teleport on the Ancient Magicks spellbook. This spell requires at least level 66 Magic, two Law, and one Blood rune. Port Phasmatys is along the road leading out of Canifis, leading east. 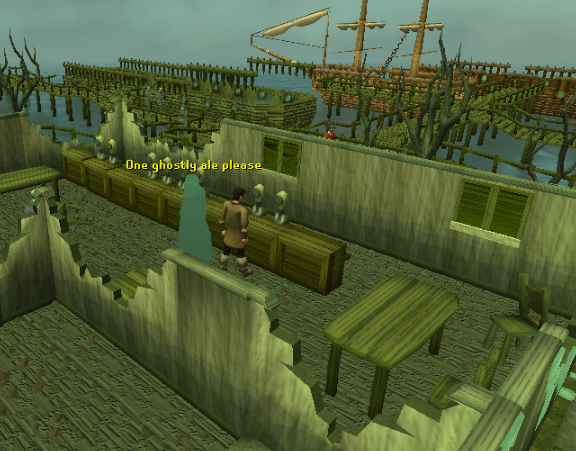 The Green Ghost is a bar located north of the bank and west of the docks. You cannot buy anything here because most of the citizens are ghosts and do not require drinks. Over time, the pumps have run dry. This bar plays a pretty big role in the Ghosts Ahoy quest. Even though you cannot buy drinks, there is a Brewery located in the basement. It is one of the only two in the game. If you have a pot and 5 Ecto-tokens, you can buy Ale Yeast from Metarialus. You can read more about this place in the Brewing guide. The bank is located southwest of the docks. You do not need a quest to access it, nor do you need a Ghostspeak amulet. Wearing a Ghostspeak amulet makes it faster by eliminating the message you get when you click on the bank. Wearing the amulet would be a good idea if you are training Smithing because of the close furnace across from the bank, or training Firemaking due to the long stretch of road outside of the bank. Velorina's house is located just northeast of the northern part of the docks. She is the start of the Ghosts Ahoy quest that you've already heard so much about in this guide. This is also where you go to get back your Ectophial upon loss. You will always lose your Ectophial when you die with it in your inventory. Located just south of the northern entrance and east of the western entrance, this marketplace does not have a very fit stock. The only real excitement is a ghost known as Gravingas holding a protest against Necrovarus. Just north of the city and out of it's gates, there is a Summoning Obelisk for you to recharge your points. This is useful because players who use the Ectophial will appear just south of the obelisk. They can simply recharge their points and walk to the bank to continue their trip. The furnace is located just north of the bank, across the road. 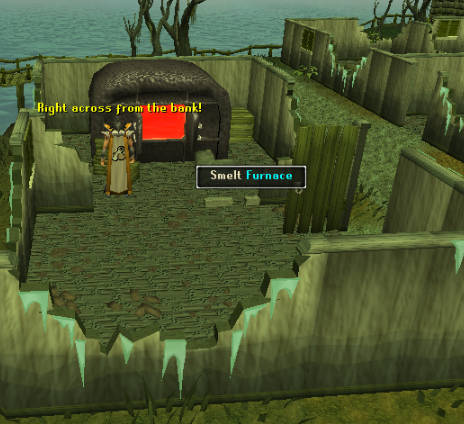 It is a very popular location to train Smithing because it is the third closest furnace to a bank. There is only one general store in the city. This seems to be the only location where goods are sold (not including the Charter Ship's store). 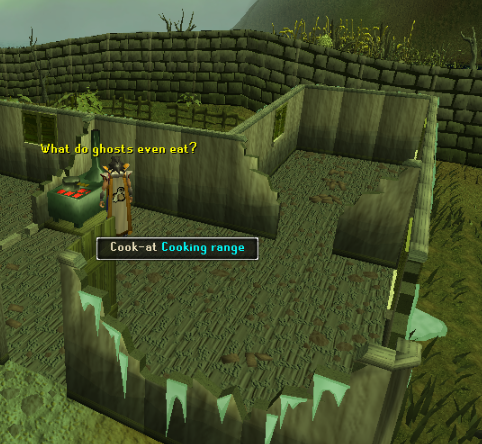 Directly west of the bank and southwest of the furnace, this serves as the same purpose as any other range in the game. To the very east stretch of the docks, you will find a ship. When you board it you will find Bill Teach walking about the deck waiting to take you to Mos Le'Harmless. 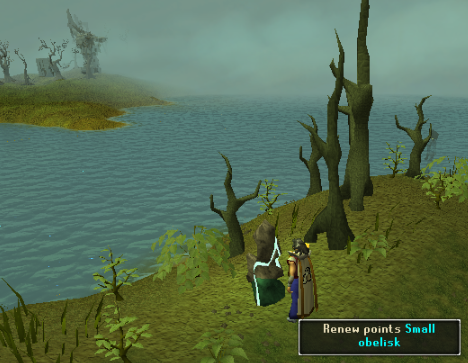 You may only sail to this place after completing the Cabin Fever quest. This is located just northwest of the ship to Mos Le'Harmless is the Charter Ship dock. On the stretch of the dock leading north from the location east of the bank, you will find a ghost captain to the east on a small dock connecting to the main dock. He will take you to Dragontooth Island for a fee of 25 Ecto-tokens. This particular island plays a part in the Ghosts ahoy! and Rocking Out quests. 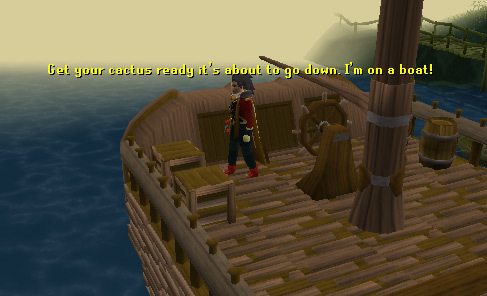 Players who have started the Rum Deal quest may take a boat to Braindeath Island. The dock is located on the eastern shore outside of the city and north of the Ectofuntus. Be careful though, getting there can be very painful with Pirate Pete as your captain. The Ectofuntus is probably one of the most popular reasons people come here. It is located north and outside of the north gates of the city. It is a place for you to train prayer, get those Ecto-tokens that you've been hearing about this entire guide, and offers a safe spot of teleportation giving access to the city. 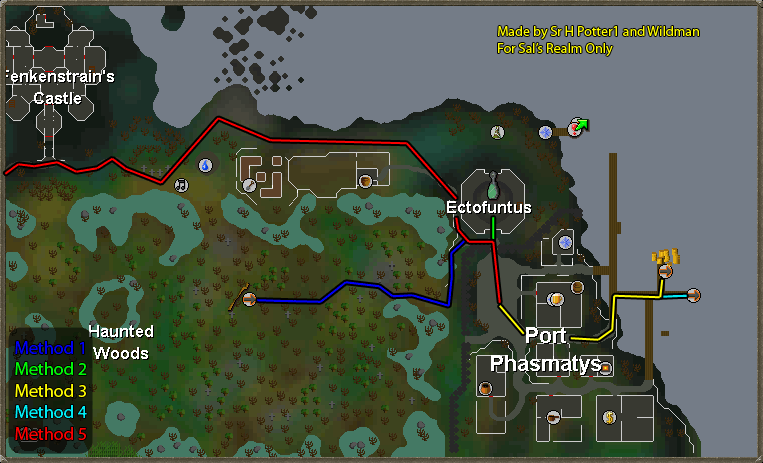 The Ectofuntus is a great way to train Prayer. It is a bit slower way of training prayer than the Gilded Altar, but it offers more experience. For every bone you use, you will receive 4x the experience. If you have completed the Ghosts Ahoy quest, you can use the Ectophial to teleport back to the main ground so that you do not have to keep walking up and down, this makes your experience gain much faster. A bit of history. Remember at the beginning of the guide when you were told that the Vampyres were after the citizens? Well, the Ectofuntus pretty much kept them away. Necrovarus had his followers dig a hole until they found some ectoplasm. He then had a temple built over the slime pool, and then a fountain shrine which we know as the Ectofuntus. The power of the Ectofuntus kept away the Vampyres, but it also killed the citizens and turned them all to ghosts, instead of letting them pass to the next world. This turned the town into the unfortunate settlement we know of today. To worship the Ectofuntus, you will need a bucket of slime and a pot of ground bones of the type you will use. To collect your Ecto-tokens, talk to or right click and select "Collect" on one of the Ghost Disciples. 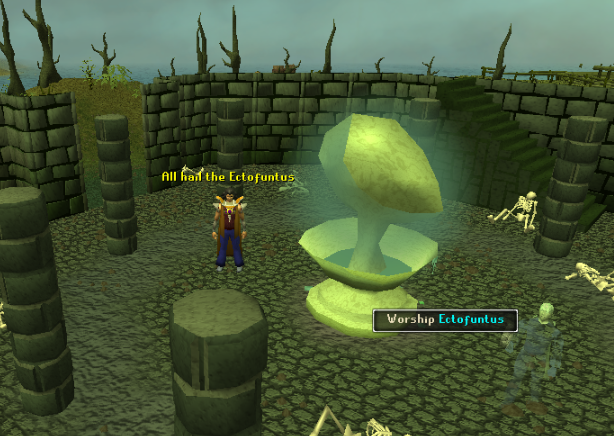 More information on the Ectofuntus and how to use it can be found in the Ectofuntus guide. Port Phasmatys is home to a few quest start points. Talk to Bill Teach in his location at The Green Ghost Inn to start the Cabin Fever quest. Talk to Velorina in her house just northwest of the north entrance to the docks to start the very helpful and rewarding Ghosts Ahoy quest. 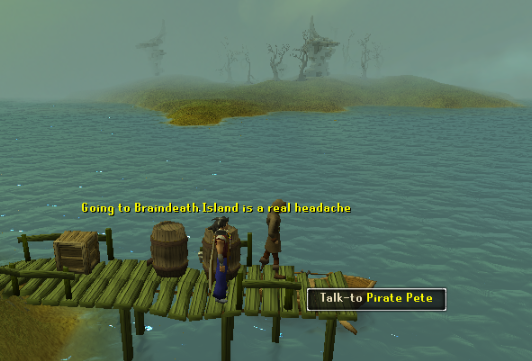 Talk to Pirate Pete north of the city on the dock where you take the boat to Braindeath Island to start the Rum Deal quest. This man is a trader from the eastern lands. Not much is known of him, however he takes part in the Ghosts Ahoy quest. 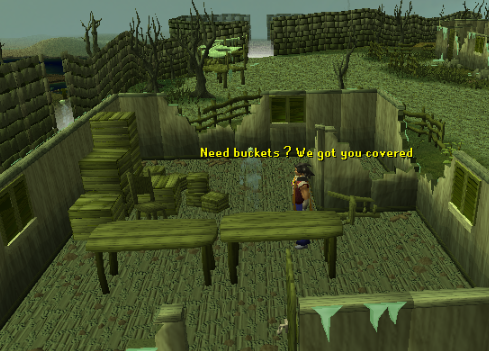 He will sell you Bolt Racks used for Karil's Crossbow from the Barrows Activity. Bill Teach is the start of the Cabin Fever quest. He has two locations: Walking around the Green Ghost Inn, and on the deck of the ship that takes you to Mos Le'Harmless. He will also take you to and back from Mos Le'Harmless after the Cabin Fever quest. These two people act as employees for part of Trader Stan's Charter Ship crew. They serve as a store and mode of transportation to other Charter Ship ports. Droalak plays a part in the Making History quest. If you talk to him after the quest, his soul will be free and he will disappear from the game forever. Located in the bank, he has the same functions as a normal banker. 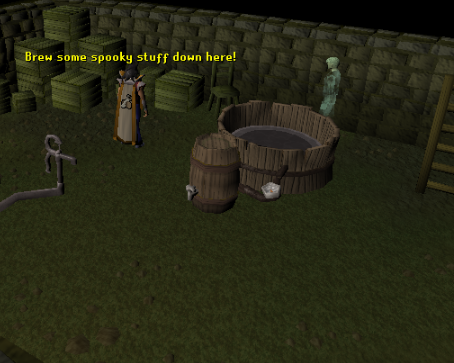 You can use the bank without wearing your Ghostspeak Amulet but you will always get a message beforehand. You will not be able to understand what he is saying without wearing the amulet. There are two of these. 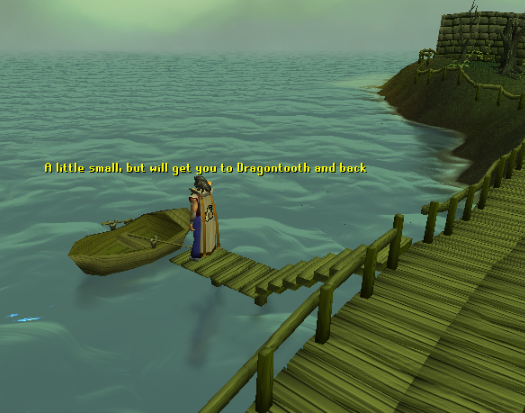 One is at the rowboat that will take you to Dragontooth Island, and one is at an unusable boat at the far west stretch of the dock. After you have worshiped the Ectofuntus, you may talk to them to collect your Ecto-tokens. They will also give a history on the Ectofuntus and help you out with worshiping it if you are a beginner. These are the guardians of the Port Phasmatys walls. You need a Ghostspeak amulet to understand that you need to pay 2 Ecto-tokens to enter if you have not done the Ghosts Ahoy quest. Afterward, you will not need it. Located inside the Green Ghost Inn, this man does not sell beer due to the pumps drying up. Instead, during the Ghosts Ahoy quest, he will give you a bedsheet. That bedsheet is part of the quest, and is also what I am wearing in some of the pictures in this guide. These guys cannot take you anywhere, but you can have a conversation with them if you are wearing your Ghostspeak amulet. They will give you a bit of information on their trading economy. He is located at the general store and will sell you various useful items. Ghost Villagers can be found wandering around any part of the city. They are rather impolite when you talk to them and insist that you do not bother or talk to them at all. Located in the marketplace, Gravingas holds a protest against Necrovarus. Interesting fact, if you are wearing a Ghostspeak amulet, he faces south. If you are not, he faces north. Try equipping and taking off your Ghostspeak amulet to try it out! Melina plays a part in the Making History quest. She is admired by Droalak. After you give her a Sapphire Necklace in the quest, her soul will be set free and she will disappear from the game forever. Metarialus is located in the basement of the Green Ghost Inn. Players who have an empty pot in their inventories may buy ale yeast from him for 5 Ecto-tokens. Necrovarus is located near the Ectofuntus. He came to Port Phasmatys from the eastern lands and established the Ectofuntus to protect the city from invading Vampyres. Sadly, he is also the reason that all of the citizens have died and their souls unable to pass. Some see Necrovarus as a tyrant. Though he may be, he is the only one protecting the city. Located in the Green Ghost Inn, this man is one of the only humans in the city. He has a serious gambling problem, as you can see in his part of the Ghosts Ahoy quest. Velorina is located northwest of the northern entrance to the docks. She is the start of the Ghosts Ahoy quest. If you have lost your Ectophial (which you always will if you die with it in your inventory) you get get it back by talking to her.